The story that was just told used an analogy of a tank as a virus and the police force and CIA as the immune system. We will now tell the same story using the cells of the body to restate the infection of a cell with a virus and the response of the immune system to that infection. These points are important to understand so that you will have a firm grasp on the details of immunity. We vaccinate many animals each day with vaccines created from viruses. There will be many questions that you will be asked by your clients, regarding vaccination protocols and the effectiveness of vaccinations in their pet. This foundation will allow you to speak with the confidence that understanding brings. Figure 1. 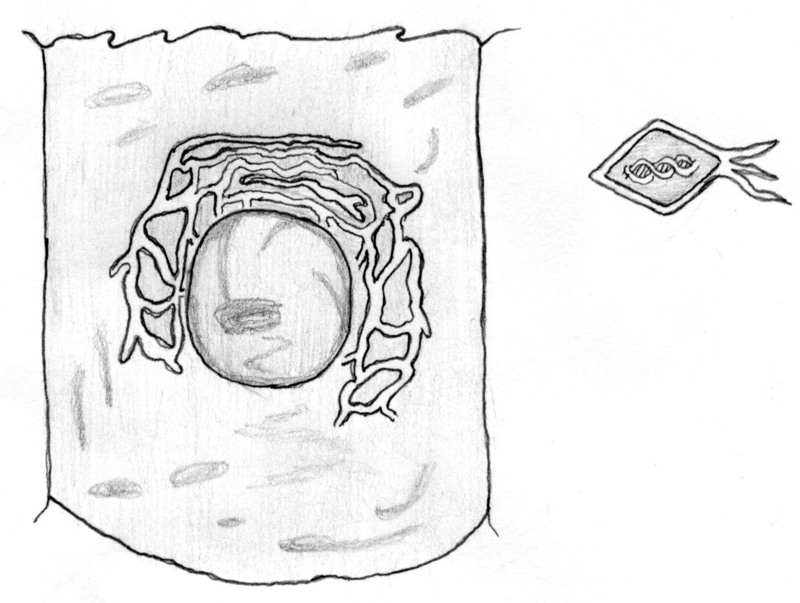 A cell of the body consists of a nucleus surrounded by cytoplasm which is contained by the cell membrane. The cellular machinery or endoplasmic reticulum is shown surrounding the nucleus. A virus is approaching the cell with its DNA. 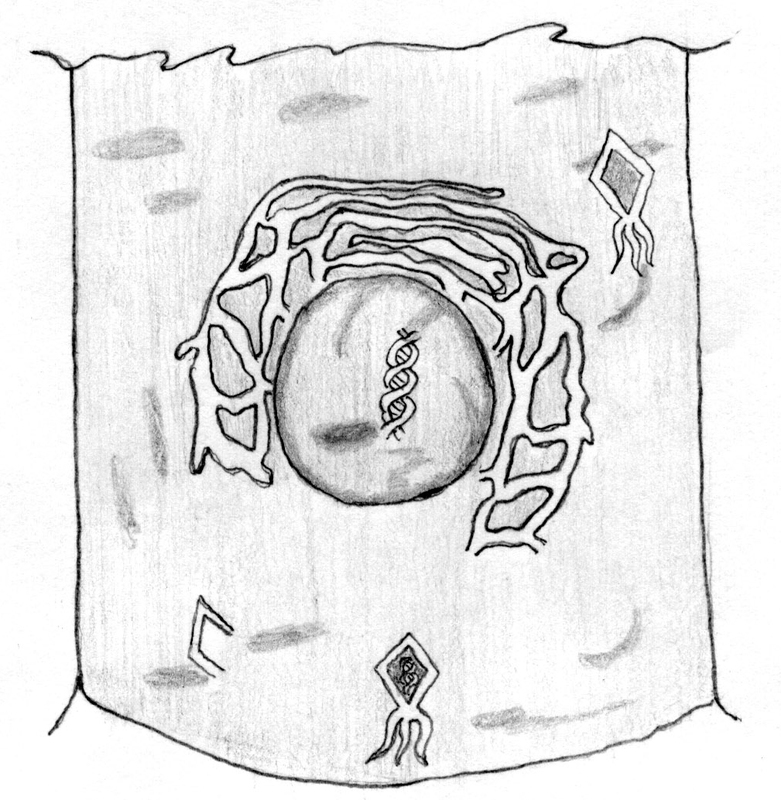 Virus— A virus is shown in Figure 12 approaching a cell for infection. A virus is a simple organism that cannot reproduce by itself. A virus must use the cell of another living thing to help it reproduce. A virus must first gain entry into a cell. This may be accomplished through several methods depending on the virus. 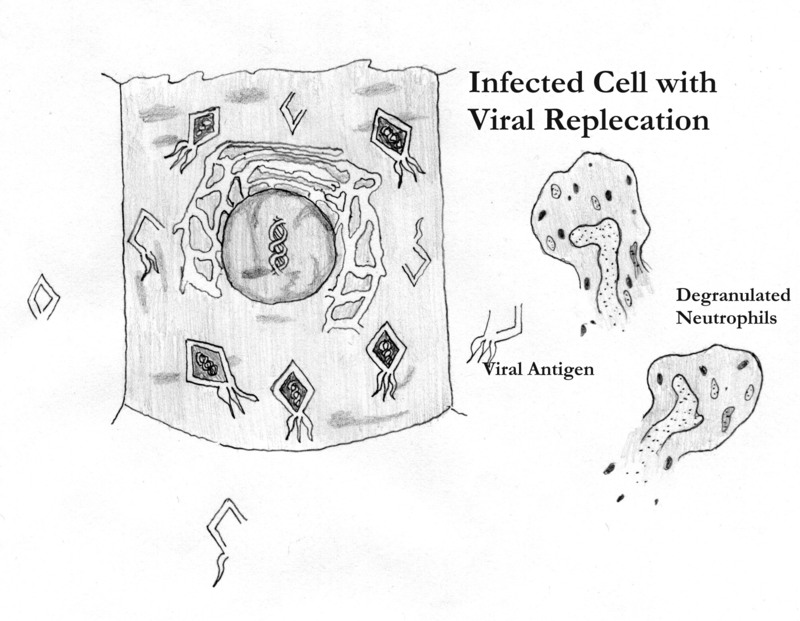 After the cell is entered the virus will replicate. During Viral reproduction/replication the cellular machinery is directed by the viral DNA to produce more viruses. Viruses need to have the appropriate cell to reproduce itself. Therefore certain viruses will only affect certain tissues. This is why we can have a respiratory infection with one virus and an intestinal infection from another. The viruses are usually very specific for the cell type they will infect. Usually this cell machinery is necessary for reproduction. Using our previous analogy – it would be difficult for a tank to enter a tissue factory and expect the factory to replicate a tank. This is why we chose an automotive factory to make tanks and not a Charmintm toilet tissue factory. Figure 2. Cell with virus infecting. 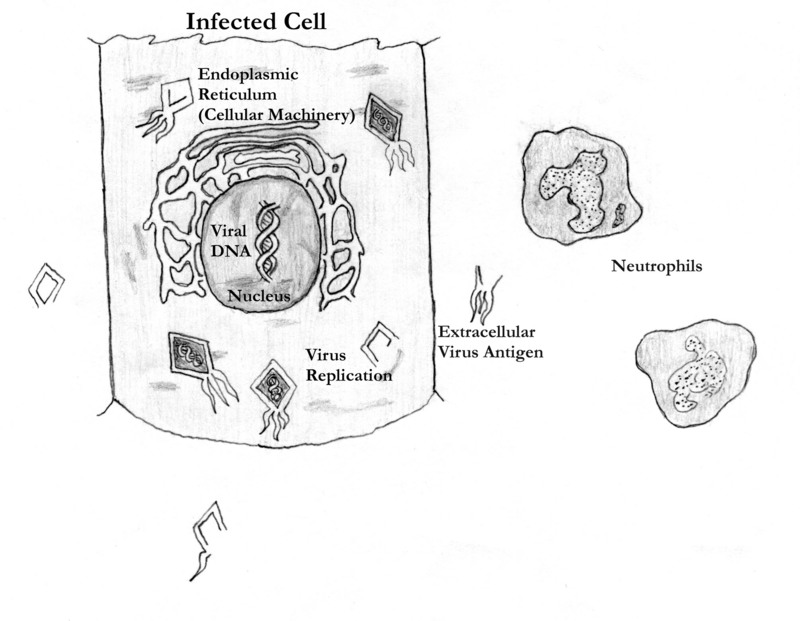 The virus DNA has been inserted into the cell nucleus. Figure 3. Infected cell starting to manufacture viruses which are seen in the cytoplasm of the cell. Antigen— Any substance inside living body and is considered foreign or harmful to that body. Most antigens are protein. Antibodies are made in response to antigens that are considered potentially harmful to the body. 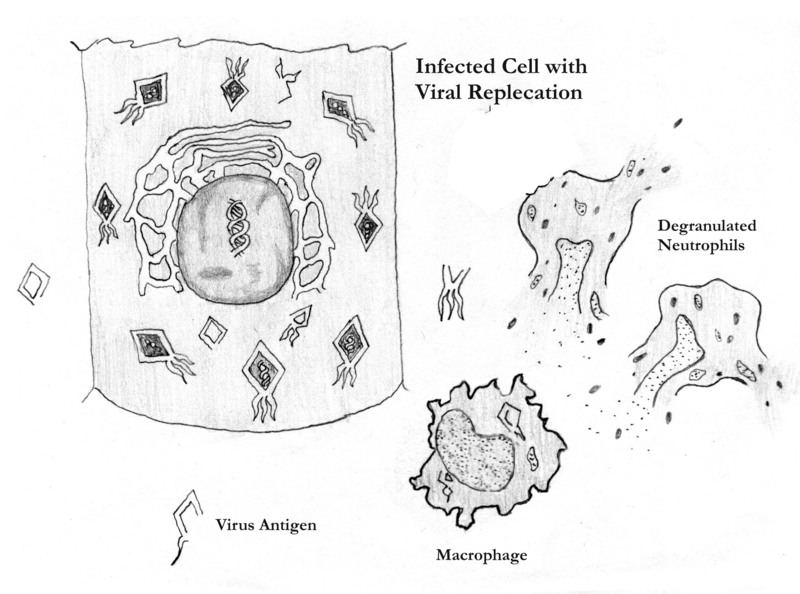 When a cell is infected by a virus there are certain antigens that appear on the infected cell. These antigens are recognized as being foreign, and antibody production is initiated. In our analogy these antigens were represented by tank barrels or tank parts. IgA— Is the antibody class that is found in mucous secretions. These secretions are found in the respiratory tract as snot, in the gastrointestinal tract as mucous that mixes with ingested food, and in the genitourinary tract. This class of antibody acts as the first line of defense against foreign invasion. IgA antibodies can be formed very quickly. The antibodies are formed within 24 to 48 hours. The intranasal vaccinations are designed to stimulate this type of immunity. The intranasal vaccines are Bordetella, F.I.P., F.V.R.C. IgG— Antibodies circulate in the blood stream in response to a systemic infection (infection affecting an internal body system or all body systems). This antibody takes ten to fourteen days to develop. This antibody is produced in the lymph node in response to infection or vaccination by a foreign infectious agent. This antibody is the most important in maternal transfer in immunity to a neonate. In the adult, it constitutes eighty-five percent of the antibody present. IgM— Is a complex antibody that is in a multiple form of IgG. It may be the most important form of early immunity against bacterial infections of the blood (bacteremia). IgD— This antibody has unknown function. It may function as a precursor or early receptor that is later turned into one of the other antibodies. IgE— This antibody is responsible for severe acute and occasionally fatal allergic reactions. It is responsible also for other allergies and helps to combat parasite infections. White Blood Cells— There are five types of white blood cells in our bodies and the bodies of our pets. These white cells all play roles in our immune system response. They are Neutrophils, Eosinophils, Basophils, Lymphocytes and Monocytes. They were named long ago based on their microscopic appearance and their ability to take up stain. The neutrophils, eosinophils and basophils had the same shape nucleus (poly morpho nuclear – AKA PMN “many shaped” – “jumbled”) but would stain with different dyes in different acid or basic conditions . Neutrophils did not stain and eosinophils stained red and basophils stained blue. The lymphocytes are found in the lymph nodes and the monocytes have a singular shape to their nucleus – mono=one. It is helpful to know the difference between these cell types because they perform different functions in the immune protection process. Elevation or depression of the numbers of these cells can give us many clues about the disease process. Figure 4. 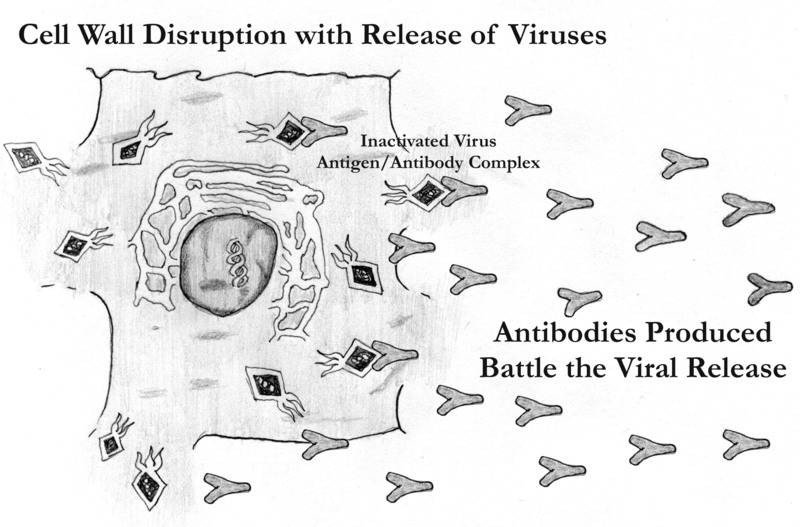 This infected cell illustrates the initial response to viral infection. Neutrophil— This white blood cell is responsible for a large part of the surveillance of the body. It is very non-specific in its actions in that any tissue destruction of any type be it bacterial, viral, or parasitic, will cause activation of the neutrophil. This activation causes attraction of macrophages and other white blood cells into an area of disease to allow their individual and cooperative functions to happen. Neutrophils account for 85% of the white blood cells in the body. They are the first line of white blood cell defense. If their numbers are elevated then it means an active infection is present. Low neutrophil numbers is a very poor sign as it means that an overwhelming infection may be present. Neutrophils may live for only twelve hours. In our previous analogy, neutrophils were the local police force. They are the every day surveillance found in all tissues and the blood stream. When evaluating blood tests, elevation of neutrophils usually indicates bacterial infection or infection with significant tissue damage. Figure 5. When neutrophils arrive at the scene of infection, they degranulate releasing chemical mediators of inflammation. These chemicals perform many functions including attracting macrophages. Monocytes— These cells are a bit confusing in that they have several other names depending on their location or particular function. They are called macrophages or histiocytes when in tissues and monocytes when in the blood. They are a larger cell than the other white blood cells. They also have a large capacity for phagocytosis – which is a term to denote eating or engulfing substances. Monocytes that are eating things are called macrophages (big eater). These cells will contribute to the immune system in several ways. They will help clean up the war zone in severe disease processes acting like big vacuum cleaners. They also pick up foreign antigens of viruses or bacteria. They carry these antigens to the lymph node for antibody production. The ability of the macrophage to “process” these antigens is essential in a fast response to disease. In our analogy these cells were the “Urban Assault Vehicle which was shown to be hauling tank barrels around. Monocytes are elevated on blood tests when an infection is chronic or long lasting and persistent “clean-up” is needed. Figure 6. The monocytes (macrophage) has arrived. This cell has picked up viral antigen and will be transporting it back to the lymph node for analysis. Lymphocyte— Type of white blood cell – very active in the immune system. There are two major types of lymphocytes. The T-Lymphocyte which has an active function in the immune system of killing actual viruses and killing cells infected with viruses or tumor type cells . The T-lymphocyte is called the killer T-Cell. The term “cellular immunity” is used to describe T-lymphocyte function. This immunity is distinguished separately because it is specific. that is that the T-lymphocytes are targeting a particular offender. They are programmed to be looking for a specific infectious agent. They can actually destroy or “kill” the agent. In our analogy they would be a guided missile or anti-tank missile. The macrophage and the neutrophil on the other hand are not specific in their actions. They are interested in any foreign agent The B-lymphocyte lives in the lymph node, circulates in the lymph and in the blood stream. The B-lymphocyte produces antibodies by creating lymphocyte clones specifically for the production of a particular antibody. These clones reside in the lymph node and will make identical antibodies for a particular virus or bacteria. Antibodies produced in this manner may not be able to actually kill the organism yet they will tag it for destruction by the killer T-cells. In our analogy the “corks” may inactivate the ability of the tank to blow holes in a factory but they do not prevent the tank from driving around the city – running over people. Think of these “corks” as a red flashing beacon that alerts the rest of the body to the viral invader. Killer T-cells will “see” this antibody tagged virus and kill it by exploding on it or by activating complement* or other chemical mediators of cellular destruction. *Complement is a term for a system of chemicals that can cause destruction of cells which can be turned on under special circumstances and is a part of the cellular immune response to disease. As you can see the immune system works together to provide both cellular and humoral (antibody) protection to the body. Lymphocyte numbers on the blood count may be decreased in viral infections and may increase in leukemia or persistent infections. Figure 7. 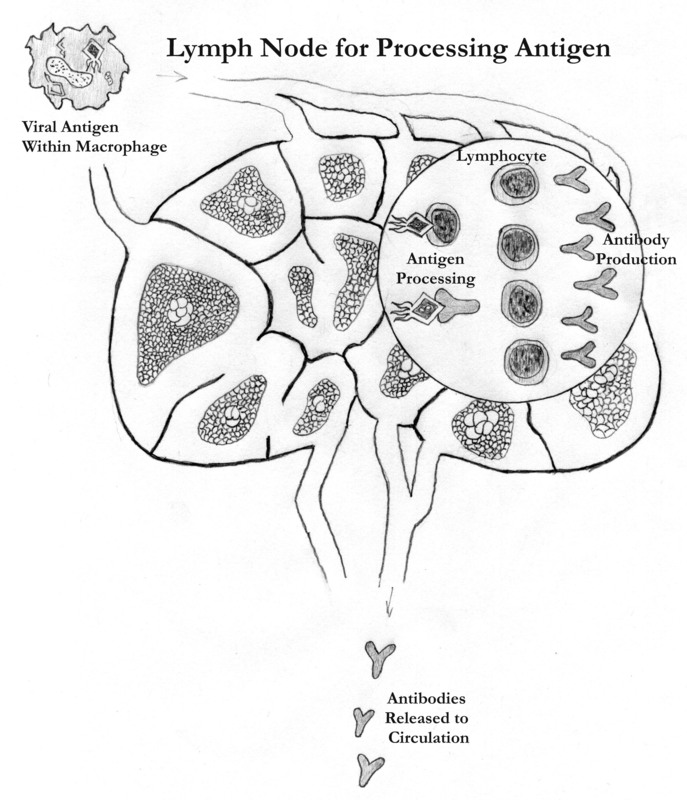 The lymph node is shown with the individual lymphocytes processing antigen to make antibodies. These antibodies are very specific for the virus which they were created. The antibodies are then released into the blood to help fight the infection and to prevent other cells from being infected. Figure 8. 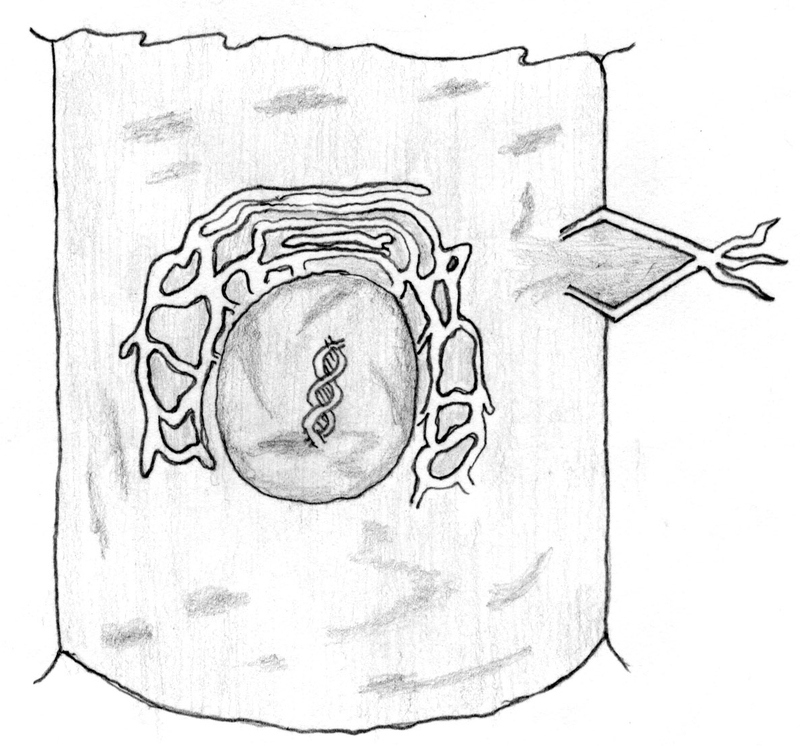 This illustration shows the cell that was initially infected. This cell now has died and the viruses that were created within this cell are now spreading to other cells. Just as this happens, antibodies are arriving to inactivate these viruses. Eosinophils and Basophils— These are cells that structurally appear very similar to the neutrophil. They have different staining characteristics and therefore different names. It turns out that the staining characteristics also differentiates their function as well. Eosinophils participate in the immune reaction against parasites such as heartworms, fleas, hookworms and mange. Therefore in the presence of these diseases, the number of eosinophils in the blood will be elevated. Eosinophils ingest antigen-antibody complexes and are most active during allergic reactions . These cells will be elevated in the blood when the animal has allergies that are constantly stimulated such as in allergies to pollens, or grass or to the bite of a flea. Basophils seem to function in a similar fashion as eosinophils because their numbers are elevated with the same disease reactions. Yet very few basophils are found in the blood and they seem to be present only in severe cases of allergy or parasitism. Basophils contain the compounds histamine and heparin. During immune responses these compounds are released. Histamine causes many of the respiratory symptoms of allergy and asthma.